Rivian shared the floor at the LA Auto Show with giant automakers like Ford, Honda, and Nissan. Kia introduced the new electric version of its Soul crossover SUV at the LA Auto Show. The Rivian display at the LA Auto Show opened Wednesday, Nov. 28, 2018. This week in a packed LA Auto Show presentation room, the crowd hooped and hollered when Rivian’s electric pickup and SUV pulled on stage for their big debut. 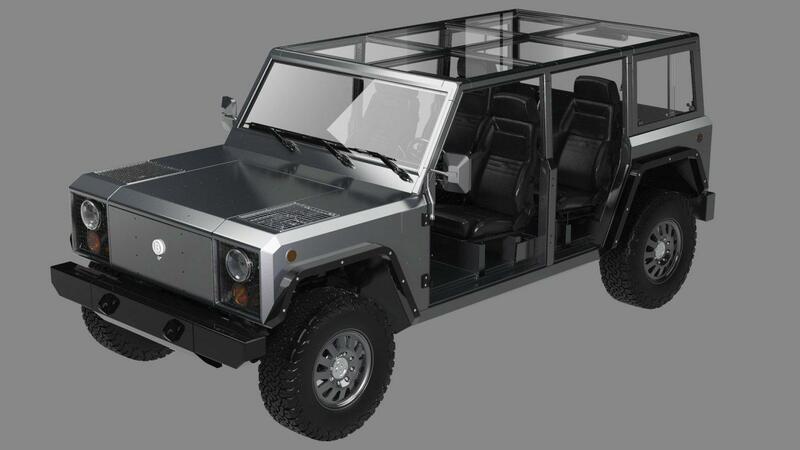 The B2 electric pickup truck being built by Bollinger Motors. Experts tell GLT they don’t see the EV market as a zero-sum game, that there’s enough future demand that more entrants are needed. But in that equation, there is one big variable: How quickly will big, legacy automakers launch their own EVs, and what will that mean for the Rivians? Either way, Rivian has advantages and disadvantages. More on those later. Electric vehicles remain a small part of U.S. auto sales—around 1 percent as of last year—but that’s expected to rise rapidly. Navigant Research projects that the plug-in electric market could be over 2.7 times larger in 2020 compared to the market size in 2017. Navigant says plug-in electrics will likely become the leading global road transportation technology by 2050. “They’ve had 10 years now to try and do something in that realm, and they’re just going so slowly. It’s going to be another 10 years before you have a significant percentage of EV sales,” he said. The Tesla Model X (with the doors up) at the LA Auto Show on Wednesday, Nov. 28, 2018. Bollinger said he’s aiming at a different consumer than Rivian. Bollinger’s targets are off-road enthusiasts who care about the environment and are hands-on with their stuff. Byton’s M-Byte crossover SUV, with a giant 49-inch dashboard screen. It’ll start at $45,000 and be available in 2020. It shares 65 percent of the same components as its companion sedan (the K-Byte). Byton is a Chinese company with a home base in Silicon Valley. Kia will launch two electric crossover SUVs next year: the Niro EV and the Soul EV. The Niro will start around $30,000 after tax credits, with 239 miles of range and 200 horsepower. “This just might be the world’s most cost effective fully electric SUV,” said Kia Vice President of Sales Bill Peffer. Tesla’s Model X, an SUV that is already on the market, starting at $84,000 before incentives. It seats seven, just like Rivian’s SUV. It offers 295 miles on a single charge, going zero to 60 in just 2.9 seconds. The Audi e-tron SUV will hit the market in 2019. It’s Audi’s first EV, starting at $74,800. The e-tron is “a testament to our brand’s commitment to premium electrification,” said Audi of America President Mark Del Rosso. He said 30 percent of Audi’s sales volume would be EVs by 2025. That’s just on the SUV side. Tesla founder Elon Musk has said they’re working on a pickup too, though the timing is vague. Ohio-based Workhorse is launching its W-15 EV pickup, but it’s aimed at commercial and fleet use, not the “adventure” consumers that Rivian is targeting. SUVs and trucks now make up two-thirds of the U.S. market, and big automakers are moving away from smaller cars. That was part of the reason behind GM’s announcement this week that it would cut up to 14,000 jobs and possibly close five plants, part of a major restructuring that will prioritize the company's electric and autonomous vehicle programs. Detroit is known for making pickups. Why hasn’t it made an electric one yet? “Because it doesn’t make money. The big guys know how expensive it is, and they’re pretty much waiting until batteries and other components are further along and cheaper so it makes sense. The big guys really don’t want to do it, and they say that out loud,” Bollinger said. That’s true. GM’s leadership recently said they don’t have any plans for electric pickups. “Some people who weren’t paying attention at (Rivian’s) launch said, ‘Oh, this is the electric alternative to the F-150.’ This is not that,” said Jim Womack, an early advisor to Rivian founder and CEO RJ Scaringe and a leading voice on lean business principles. Scott Burnell, global lead for business development and partner management at Ford, during a panel at the LA Auto Show. “This is a different kind of vehicle that nobody has seen before, that has a totally different set of attributes. And it’s not envisioned as a 2-million unit per year product. RJ has no interest in that because he doesn’t believe there are 2 million people who want the same thing,” he said. It’s a scary time for big automakers, said Scott Burnell, global lead for business development and partner management at Ford. A good scary, he said. “The reality, for us and for any other company that has a scale of 200,000 employees, is it’s not easy to turn that ship,” said Burnell, who helps Ford vet potential partners, including startups. Given its lead position in the market, comparisons to Tesla are common for any EV startup—and Rivian is no exception. “The Elon Musk of electric pickup trucks?” read the headline of a story this week in the Los Angeles Times about Scaringe. One of Tesla’s biggest advantages is arguably Elon Musk himself—a spotlight-seeking showman. Could the same be true for Scaringe, the 35-year-old car nut with the Ph.D. from MIT in mechanical engineering? Rivian founder and CEO RJ Scaringe doing a media interview Wednesday, Nov. 28, 2018, at the LA Auto Show. “A lot of Tesla is the cult of Elon and his personality,” said Chelsea Sexton, an EV industry watcher based in LA. “Not unlike Steve Jobs at Apple. And RJ is not that. But on one hand, as long as the story gets told, there is ample room for humility in our space. Womack, the Rivian advisor, also noted Scaringe’s humility. “He’s a real contrast to the kind of predominant model of entrepreneur, which is this very hard-charging kind of guy who’s gonna do what it takes to be a billionaire. I’ve known RJ for 10 years. And he’s never talked about making money. It’s never come up,” he said. Rivian’s products—a luxury SUV and pickup—are unique. Also unique is that Rivian will mostly build them in-house, without outsourcing big things to outside firms. It’s building its own battery packs (but buying the cells). It has its own manufacturing plant in Normal. Its staff in San Jose, Calif., is doing the self-driving technology and data. That’s in contrast to the collaborative approach taken by other companies. GM and Honda, for example, announced a partnership last summer to develop next-gen batteries together. “The reality of what it takes to launch a product in the automotive industry, and all the barriers and the requirements and specs you have to meet, you can only do it with a Tier 1 partner,” said Ian Simmons, vice president for business development, corporate engineering and R&D for Magna International, a massive Tier 1 auto supplier based in Canada. “It’s almost impossible to get there on your own,” Simmons said. Rivian isn’t going it completely alone. Its largest shareholder is Abdul Latif Jameel, a Saudi-based auto distributor with ties to Toyota. Another investor is the Sumitomo Corp. of Americas, a Japanese company that sources, logistics, and installs product equipment for automakers. And Scaringe said partnerships could also go the other direction. Rivian’s vehicles are built on a common “skateboard” (which houses the battery packs), and Scaringe said that platform and related battery technology could be sold to other businesses. They might put a different “upper” (or vehicle body) on top of the skateboard, opening up a new revenue stream for Rivian, he said. “This is something we’re not talking about publicly yet, but there’s a lot of activity,” he said. The electric automaker Rivian earned a lot of good press, consumer curiosity, and even a few jaw-drops this week as its pickup and SUV were finally revealed at the LA Auto Show. But will those translate into sales? UPDATED 7:40 p.m. | Rivian made a big splash Tuesday at the LA Auto Show as it revealed its electric SUV and made the case that it’s positioned to succeed where many other EV startups have not.